Preflight action – Know all that you can know – EHFC Members Talking! By: Larry F. Baum with expert sleuthing by H. Michael Newman! So what’s that really mean? You can spend hours reviewing all sorts of information and still not be familiar with “all” available information. Most of us who have been flying for a while have developed a manageable system that involves understanding the weather, the route, the airspace, the airports along the way with particular attention paid to the departure and arrival airports, possible alternates, any TFRs or special use airspace and NOTAMS. OBST TOWER 1673 (189 AGL) 4.44 ENE LGTS U/S (ASR 1281346). WIE UNTIL 02 APR 19:50 2012. What the heck does ASR 1281346 mean?? Definitely non-obvious. To a pilot, ASR means Airport Surveillance Radar, but the numbers, no idea. Mike asked me. I asked David St. George and some others. No one had a clue. However, being a true sleuth as well as a flight instructor (retired), Mike took on the mission to find out the meaning. The first response has something to do with surfboards. Wikipedia translates ASR from the Arabic as the “afternoon prayer”. There appears to be a problem with ASR brand of hip replacements. The seventh entry on Google mentions the FCC’s Antenna Registration System (ASR). You will note the acronym does NOT match what it stands for. However, “FCC” and “Antenna” piqued Michael’s interest. Go back to the NOTAM – “OBST TOWER” refers to an antenna. 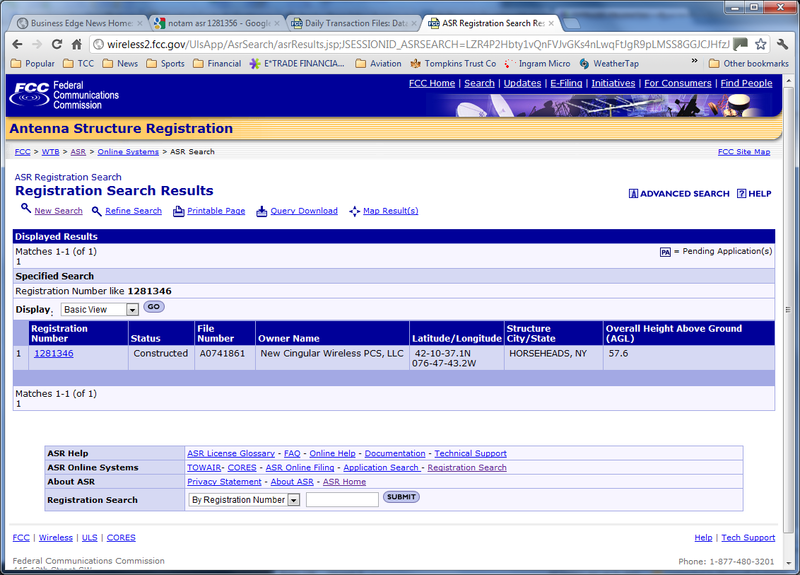 So with a bit more sleuthing, Mike discovers that the FCC maintains a database of all registered towers. Checking into the dataset and entering “1281346” provides you with this result. There’s a new antenna (actually constructed in October 2011) in Horseheads New York that has a problem with its lights according to the NOTAM. Problem solved! We now know that ASR followed by a series of numbers refers to the “antenna structure registration” inside of a NOTAM. I won’t speculate why this is useful information for a pilot to know. But wait…the overall height above ground according to the FCC is 57.6 (AGL)! The NOTAM says 189 AGL. Why the difference? More thinking and sleuthing. Divide 189/57.6 and you get 3.28125. Ah…Feet vs meters! Yes, the FCC works in meters while the FAA works in feet!!! Our government at work. Remember the crash of the Mars probe about ten years ago! Similar problem. Regardless, make sure when flying over Horseheads, that you’re more than 189ft AGL or greater than 1,673 MSL! There’s a bit more to this story. While writing this, I happened to Google: “NOTAM ASR”. What I found were several NOTAM entries similar to the one Mike began with and one entry from a Google Group explaining how to translate a particular NOTAM, that said: ASR is the “antenna registration number – unimportant”. So now we know!